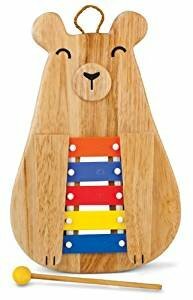 13″ Rubberwood bear design features a resonator chamber which enhances bar sustain. Five precision tuned bars in C pentatonic scale creates a pleasing soundscape no matter which notes are played. Each note precision tuned to provide an accurate musical experience. Special arm design prevents the removal of bars making it safer for toddlers. Includes wood mallet.